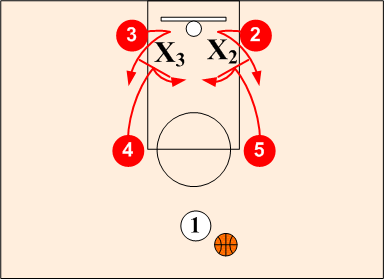 It is about basketball play and I don't understand what 'out of a down screen' is. Could anybody explain it for me please? > they gonna start off with a pick-and-roll, and then they gonna start playing from there, or they'll initiate out of a down screen. Down Screens are the most commonly used Off-Ball screens. They are primarily used to free up good shooters. Simple, but when well executed, they are a very effective means for getting the ball to good shooters for open shots. I found a interesting youtube video. Here you can see some work on setting a Down Screen. Not the answer you're looking for? Browse other questions tagged basketball terminology or ask your own question. What are some good drafting strategies for a recreation basketball league? How does one fill out a bracket? Is there a way to get scholarship to play basketball in USA if someone is from Europe? Why do only the NBA teams that are already up start pressing at the end of the game?